The Tranquility Chest Cremation Urn is finished on a high-gloss natural finish on rare elm burl veneer on solid hardwoods; the urn features a high gloss finish with a velvet-lined interior. The hinges are brass and the urn has a key with a decorative tassel. 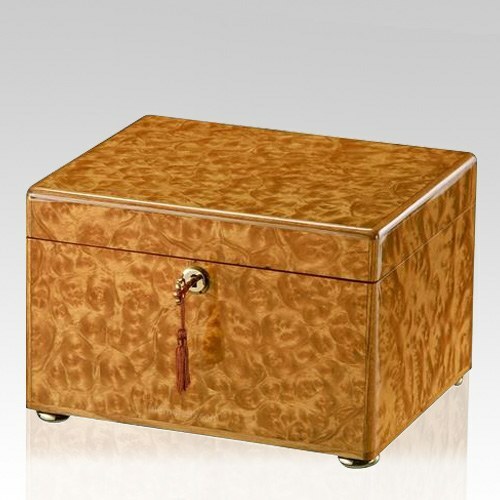 This chest urn is a classic style of a memory chest and has a fantastic finish in a deep luster wood tone. You will receive a free heirloom plate, engraved with name and date, by returning the enclosed request card. "The urn arrived promptly, in beautiful condition. My father wanted an urn for him and mom to spend eternity in. My mom passed Dec 2010 and now rests in the urn waiting for dad to join her (a long wait I hope). Dad (retired GM worker) was very insistent that the urn they spend eternity in was American made."